Very few investors, if any, obtain a significant return over time by constantly trading stock; the percentage is probably consistent with the number of successful horse race players. We also know, intuitively, that the market isn't random but that there are long term trends. We shouldn't have to ride out a downturn in the market that might persist for several years. It took over 24 years for the market to recover to the level where it was in 1929. 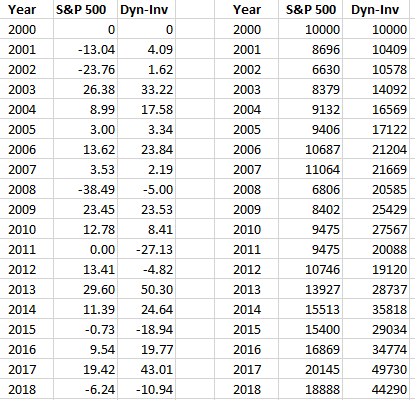 More recently, the S&P didn't recover from where it was in March 2000 until June 2007. The Dynamic-Investing system provides an alternative investment strategy. Dynamic-Investing identifies major changes in market direction and acts to take maximum advantage of those changes by recommending leverage S&P 500 index funds that advance at twice the rate the market is advancing. Why try to determine the outlook for an individual company or sector with their inherent additional risks when you only have to know the general direction of the market to obtain, through leveraging, a greater return than the market. Dynamic-Investing through extensive trend analysis, that has been proven effective in real time, identifies those major changes in market direction. Dynamic-Investing also offers simplicity. You only have to trade one fund to obtain maximum diversification and all the benefits of the Dynamic-Investing system. Investing using this approach produced the following results compared to the market. Rydex funds are used in our performance data as they have the most significant history. Dynamic-Investing switches between one of the leveraged index bull funds and a money market fund based on a timing system that has been proven effective in real time. Each weekly report has a "degree of risk" indicator that gives your approximate risk exposure before you invest. Subscribers receive an email every Friday advising whether to hold the leveraged index bull fund or switch to a money fund or vice-versa. Free 60 day trial to Dynamic-Investing - If you choose to continue to receive this service, you will only be charged $10 a month (less than a daily cup of coffee). Cancel at anytime if not completely satisfied and receive a full refund for the unused portion. You risk nothing. Copyright ©1999-2019 TM Lester Co. All rights reserved.